After failing to find much success as a publicly traded company, Twitter (TWTR) is for sale. Reports say that the social media company began fielding bids this week. Rumors are flying far and fast about potential suitors – including Salesforce (CRM) and Disney (DIS), but apparently not Alphabet Inc.’s Google (GOOGL). Twitter’s share price has dropped 40 percent since its 2014 IPO, and the company has struggled with slow growth and declining user engagement. Despite those problems, Twitter is a household name that could conceivably be turned around with new management. Even with the decline in share value, Twitter still has a $17 billion market cap. There’s the real possibility that there could be no happy ending after the company is acquired. There have been a number of splashy tech acquisitions by companies over the years, and many have been outright failures. 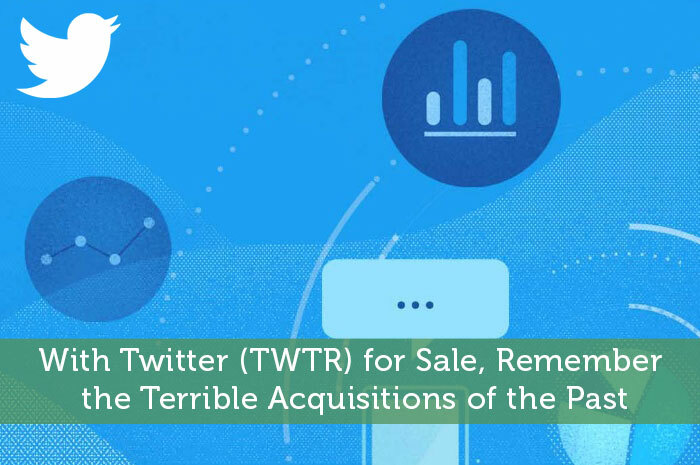 Whichever company is thinking of acquiring Twitter needs to look back on some of these debacles – both for their own sake and the sake of their investors. When it comes to horrible acquisitions, Yahoo is in a category of its own. The company, which recently was sold to Verizon for $5 billion, suffered greatly during the dot-com bubble when it overpaid for a number of properties that soon went defunct. It’s a little unfair to criticize a company for missteps during the dot-com bubble, as many companies did a poor job during this time period. However, Yahoo never stopped making bad decisions. The company made headlines when it acquired Tumblr, a hip blogging service with a young audience, for $1.1 billion in 2013. The service was justified as a way to reinvigorate the aged company. Three years later, the company wrote off more than $700 million of the purchase as a loss. Do you remember when Nokia was the leading mobile phone company? It seems so long ago. In 2013, when the Finnish cellphone company was already showing signs of weakness, Microsoft (MSFT) bought it for $7.9 billion. Nokia proved to be a white elephant that never did its buyer any good. In 2015, Microsoft wrote off $7.6 billion – almost the entire price it paid for Nokia – as a loss. One analyst called the purchase a monumental mistake. For Microsoft, it was the largest write-down in the company’s history. This purchase goes to show that even trustworthy blue chips like Microsoft can make terrible decisions. Poor Zynga (ZNGA). The mobile gaming company burst onto the scene with a fast-rising IPO in 2011. Since then, shares have lost almost 70 percent of their value. That dramatic decline can partly be attributed to poor acquisitions that never panned out. Zynga acquired game developer OMGPOP for $200 million in 2012. A year later, OMGPOP was shut down and wrote off half the purchase price as a loss. Some credit should be given to Zynga for quickly shedding its losses instead of letting a bad purchase weigh down the company for years. However, the acquisition never should have been made in the first place. It’s way too early to tell whether Twitter would be a successful acquisition or an embarrassing decision for whoever ends up making the purchase. There’s no doubt that Twitter is facing plenty of challenges. Those challenges, however, can lead to a discount price that gives the purchaser the opportunity for a decent return on investment. Sadly, it’s usually the shareholders that suffer when a company makes an unwise acquisition. Hopefully, long-suffering Twitter investors will recoup some of their investment if the company draws a high sale price.